The sciatic nerve binds the spine and the femur, and thus allows the movements of the hips, upper legs, and feet. The pain due to sciatica is unbearable and intense, and this condition is most often a result of body injuries, ruptured disc, or spinal stenosis. In the case of a sciatic nerve pain, doctors advise patients to immediately check their lower back and hips. The pain stretches to the lower limbs and feet, leading to hip and lower back pain. Leg Pain – Often in the back of the leg, and often much worse when sitting than standing up. Burning and Tingling – Burning and/or tingling sensations felt anywhere along the length of the leg. 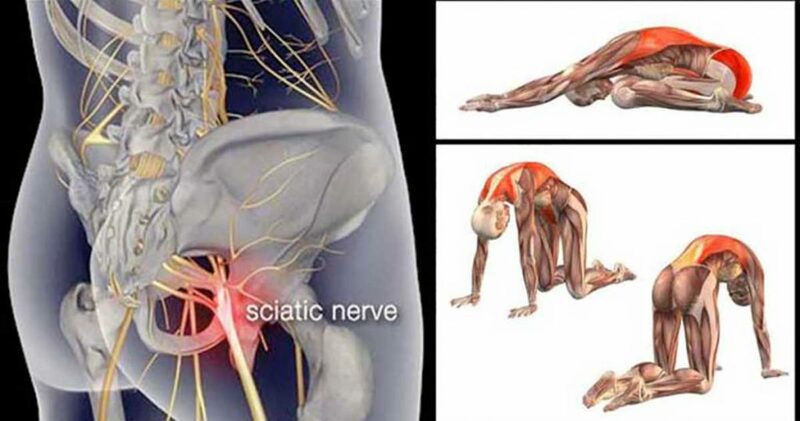 Weakness or Numbness – Other commonly diagnosed sciatica symptoms include weakness or numbness in the leg and difficulty moving your foot or toes. Chronic Pain on One Side – One of the more unique sciatica symptoms is that it tends to only affect one side or the other of a patient’s body. It may extend all the way from the lower back down to the foot or toes, but will stay on either the right or left side of an individual in the vast majority of cases. Acute Pain When Rising – Patients may experience an acute, sharp pain when rising from a sitting position. In most cases, people turn to painkillers such as ketoprofen, acetaminophen, muscle relaxants, aspirin, and antidepressants. Yet, the best way to treat this issue is to start exercising regularly. Lie down, bend the knee, cross the painful leg toward the chest, and hold it with one hand. Hold for 30 seconds. From a standing position, put the affected leg above the knee of the other leg, and lower the hip to a 45-degree angle. Bend upfront, with the spine straight, while you extend the arms to be aligned to the floor. Hold for 30 seconds, and repeat with the other leg. Lie down with the affected leg bent, and the foot near the ankle of the other leg. Curl the leg to the opposite side and touch the floor with the knee, and raise the hand of the painful side. Lower the arm in the opposite direction of the knee, while trying to touch the ground with the shoulder. Hold for 20 minutes, and repeat on the other side. Sit down, stretch the legs out and far apart, bend forward, and put the hands on the ground. Try to touch the floor with the elbows, and hold for 20 seconds. Sit down, put the feet together in front of the torso, hold the right ankle with the left hand, and the left one with the right hand. Push down the knees, and hold for a minute. Make a minute break, and wave the legs rapidly. Lie on the painful side, tilt the legs back into an L shape, with one foot on another, with the painful hip high. Raise the top knee, and hold for a few seconds. Repeat 15 times. Start with the hands and knees on the ground, and the hands aligned with the shoulders. Elevate the painful leg while keeping your knee tilt, and then lower it. Do 15 repetitions. Lie on the ground with the legs flat and the back straight. Raise the painful leg up. Put the foot on the outside of the other leg, near the knee. Keep the shoulders and hips on the ground, while dragging the knee of the affected leg across the middle line of your body. Hold for 30 seconds, and repeat with the other leg. Start on all fours, with the foot of the painful leg under the stomach. Then, curl it toward the opposite side, near the hip, and the knee toward the shoulder. Touch the floor with the forehead, stretch the other leg, and push the hips towards the floor. Hold for 30 seconds and repeat three times. Sit on a chair, cross the affected leg over the other, keep the chest upfront, and the back straight. Breathe deeply, and bend slowly. Hold for 30 seconds, and repeat with the other leg. Lie on the floor with the face down, and rest thus for a few minutes. Then, place the elbows on the ground, and breathe deeply. Go down again, and relax for 2-3 minutes. Start doing these exercises on a daily basis, and you will soon experience a major relief in the symptoms.